The XDJ-RR is a two-channel standalone all-in-one system that’s compatible with Rekordbox. 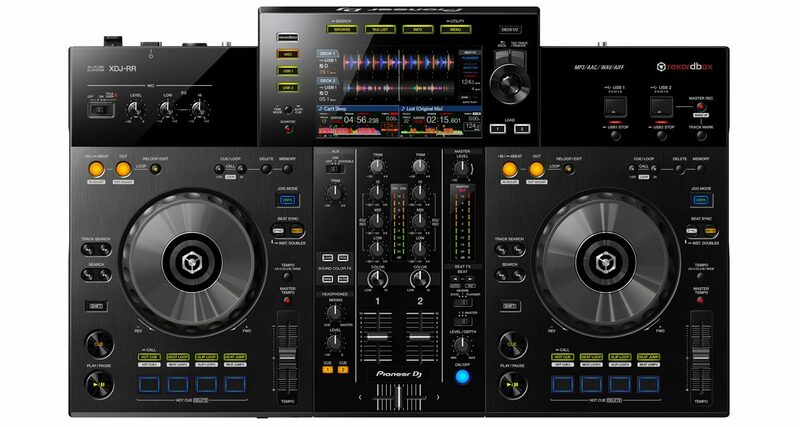 It’s basically a pared down XDJ-RX2, and despite the cut in performance controls (eg four performance pads, no touchscreen) this is still a capable standalone device, and is more than enough for its intended market of bedroom DJs looking to practice spinning on a standalone set-up that mirrors the layout of CDJ/DJM club gear. A great (if pricey) option for beginners who want the best of both CDJ / XDJ standalone operation and laptop / Rekordbox DJ-compatibility. Vinyl, USB sticks, DVS, CDs, controllers… increasingly, DJs can use whatever they want in the booth. This is the “post-format” landscape that Pioneer DJ is releasing its latest XDJ-RR standalone Rekordbox system into. It’s basically a pared down XDJ-RX2: it’s got jogwheels that don’t have centre ring lights, and fewer performance pads and onboard effects. It’s got a seven-inch display, twin USB sockets and rear USB jack, so this still is a capable standalone device. There are 1/4” and 1/8” headphone jacks in front of the unit, and the rear has a pair of XLR and RCA master outputs, an RCA aux input and a 1/4” mic input, and a USB jack for plugging in your laptop should you wish to spin with Rekordbox DJ. The face of the unit has a seven-inch screen similar to the one found on the XDJ-RX2, but it isn’t touchscreen. The Browse knob and controls for it also make it to the XDJ-RR, undoubtedly to help ease the new DJ into using the “scroll and click” system of Pioneer DJ’s CDJ2000NXS2 players. It’s got a two-channel mixer onboard with three-band EQs and a Sound Color FX knob, and there are four Sound Color FX onboard: Filter, Noise, Dub Echo, Pitch. It’s also got three Beat FX onboard (Echo, Reverb, Flanger) that are accessible via the Beat FX section beside the mixer. Each of the two channels has a jogwheel, four performance pad buttons, and looping controls similar to those found on the XDJ-RX2. I exported some music onto a thumb drive with Rekordbox, plugged my speakers and headphones to the XDJ-RR and got to work. The jogwheels on the XDJ-RR are solid and responsive as you would expect on a modern Pioneer DJ controller. It lacks the LED lights of the XDJ-RX2, but that’s not such a dealbreaker especially since you’ve got a high-resolution screen sitting atop the unit anyway. The performance pads are backlit (but they only have one colour: blue) and are small click buttons instead of rubberised pads – the response is not as lighting fast as the pads on the XDJ-RX2 because of the “button travel”, but they’re still good for pad drumming and cue juggling. The mixer’s controls work as you expect, and the knobs and faders feel solid. You can adjust the crossfader curve in Rekordbox DJ (if you’re spinning with a laptop) or in the settings menu of the XDJ-RR. It also comes with a microphone section on the upper left of the unit which has level, high and low EQ controls. The XDJ-RR has a high-resolution seven-inch screen that will be familiar to those who have used CDJs or XDJ media players as well as the XDJ-RX2 and XDJ-RX systems, albeit without touch capability. That’s both good and bad: good because you’re using more or less the same interface found on just about every other DJ booth in the world, and bad because apart from it not being touch-sensitive, it’s just a bit behind in terms of refresh rate, frame rate, and resolution. This means you’ve got to use the Browse knob and load buttons to put tracks into the decks, which can be a bit cumbersome if you’ve got a large library or you haven’t organised your music into playlists. The XDJ-RR comes with two USB-A slots on the face of the unit. You can load two USB drives and play music off of them (great for DJ switchovers or B2B sets) or you can set one USB to record music coming out of the master outputs. This is a blessing for newer DJs who want to be able to easily record their mixes so they can listen back to their sets for feedback, as well as for seasoned veterans who want a simple solution for creating mixtapes that they can then upload to services like Mixcloud. Versatility is a key strength of the XDJ-RR: you can spin with it standalone or connected to your laptop running Rekordbox DJ. 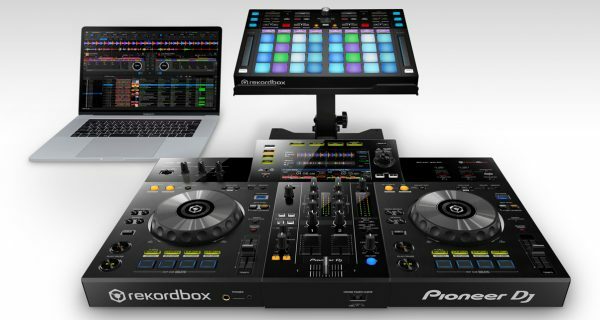 The biggest draw of the XDJ-RR is its ability to be used standalone without a computer, but it’s also capable of being used with a laptop running Rekordbox DJ. That makes it a versatile playback solution that beginner DJs can use to familiarise themselves with both spinning with and without a computer, exposing them to the best of both digital DJ worlds. If phono inputs were added to the two mixer channels and DVS was implemented, this would be a killer set-up for all kinds of DJs who want to be able to experiment DJing on different mediums to find which one suits them best. While the touchscreen and some performance controls didn’t make the cut from the XDJ-RX2, there’s certainly more than enough on the XDJ-RR for its intended market of bedroom DJs looking to practice spinning on a standalone set-up that mirrors the layout of CDJ/DJM club gear. A great (if pricey) option for beginners who want the best of both CDJ / XDJ standalone operation and laptop / Rekordbox DJ-compatibility. No lossless FLAC support for music on the USB stick I imagine on the XDJ-RR, like the XDJ-RX2? Such a shame, if thats the case, as most of my tunes are FLAC..Presumably you would need to use WAV files with no ID3 tags, or connect a laptop to use FLAC files. kind of defeats the object of an all-in-one system. Pioneer want us to spend more money on separate mixer and CDJ/XDJs for FLAC support? No FLAC on this unit Karim, unfortunately. How does this compare with DDJ 1000? I understand that this is a stand alone controller with no PC required, but other than that which is one is better to wanting to emulate club setting at home? The DDJ-1000 has a closer size and layout to a CDJ/DJM set-up 🙂 but as you mentioned, you need to use it with a laptop. I would say that if you plan on spinning without a laptop, go with the XDJ-RR (or the XDJ-RX2). Umm I’m sorry why aren’t there 8 pads on each side….this is a lazy update…sorry Pioneer it’s time to step up! I would’ve wanted a touchscreen – that would make it a definite “step up” from the original XDJ-RX. Instead of a touch-screen, would it be possible to connect a keyboard via USB to increase search possibilities? Not sure to be honest Ran. I’ve never seen it done with the XDJ units. Nice bit of kit but the screen is to small,would love a controller about the size of the DDJ Sr to have a hinged lid that folds up and contains a full size screen around 17″ to 19″ to show all that a laptop screen does eliminating the use of a laptop all together and fold down when not in use now acting as a lid to protect both the screen and controls underneath that would be something to get excited about. I currently DJ with Serato (and a Numark controller) but I’m considering switching to use Rekordbox (and a Pioneer controller, obviously) so that I can become more comfortable with club set-ups – I’m getting opportunities for gigs where I’m expected to use the ‘industry-standard’ Pioneer set-up in the club – so my question is, which standalone Pioneer system best ‘mirrors’ that standard club set-up? I want to buy a system that means I can transition smoothly from that to the club system for gigs. Thanks! DDJ-1000 is the most similar in physical feel, XDJ-RX2 or XDJ-RR are most similar in the way they work (in that you DJ from a USB drive). Neither should present you with too big a “leap” to Pioneer DJ booth gear, as you’ll still be using Rekordbox to prepare your tracks which is a big part of the “Pioneer advantage”.